Astronomers at the ESO, ESA, and NASA have observed that some stars in star clusters appear young looking than other stars. This is despite the fact that most of the stars in a cluster were formed at the same time and are roughly the same age. This observation was arrived at upon studying bright blue stars called blue stragglers which appear younger than other stars in the cluster. Star clusters, as the name suggests, are groups of stars that are grouped together. These stars are bound together by their respective gravitational fields. There are two kinds of clusters; open star clusters and globular star clusters. Open star clusters are a loosely group of hundreds of young stars. Their gravitational attraction is not strong enough to form a tight bond. A globular star cluster is made up of hundreds and thousands of very old stars whose gravitational attraction to each other is strong enough that they form a very tight spherical shape. As one goes closer to the center, the number of stars get denser. These clusters orbit a galaxy or the galactic core as one unit much like a satellite would. The Milky Way galaxy is known to host around 150 star clusters but many more are believed to be undiscovered. The closest galaxy to the Milky Way, the Andromeda galaxy, has 500 clusters while Galaxy M87 has 13,000 globular clusters. 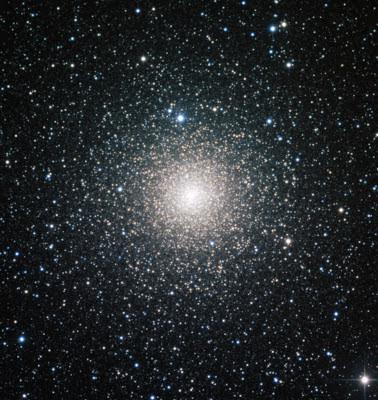 The image above shows the globular cluster NGC 6388 observed by the European Southern Observatory. Star clusters form in a short period of time, meaning that all the stars within them tend to have roughly the same age. Because bright, high-mass stars burn up their fuel quite quickly, and globular clusters are very old, there should only be low-mass stars still shining within them. This, however, turns out not to be the case: in certain circumstances, stars can be given a new burst of life, receiving extra fuel that bulks them up and substantially brightens them. This can happen if one star pulls matter off a close neighbour, or if they collide. The re-invigorated stars are called blue stragglers , and their high mass and brightness are properties that lie at the heart of this study. Heavier stars sink towards the centre of a cluster as the cluster ages, in a process similar to sedimentation. Blue stragglers’ high masses mean they are strongly affected by this process, while their brightness makes them relatively easy to observe . 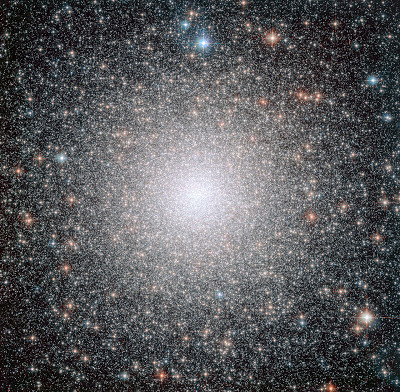 To better understand cluster aging, the team mapped the location of blue straggler stars in 21 globular clusters, as seen in images from the MPG/ESO 2.2-metre telescope and Hubble, among other observatories . Hubble provided high resolution imagery of the crowded centres of 20 of the clusters, while the ground-based imagery gave a wider view of their less busy outer regions. Analysing the observational data, the team found that a few clusters appeared young, with blue straggler stars distributed throughout, while a larger group appeared old, with the blue stragglers clumped in the centre. A third group was in the process of aging, with the stars closest to the core migrating inwards first, then stars ever further out progressively sinking towards the centre. As a cluster’s heaviest stars sink towards the centre, the cluster eventually experiences a phenomenon called core collapse, where the centre of the cluster bunches together extremely densely. The processes leading towards core collapse are quite well understood, and revolve around the number, density and speed of movement of the stars. However, the rate at which they happened was not known until now . This study provides the first empirical evidence of how quickly different globular clusters age. Blue stragglers are so called because of their blue colour, and the fact that their evolution lags behind that of their neighbours. Blue stragglers combine being relatively bright and high mass by the standards of globular cluster stars, but they are not the only stars within these clusters that are either bright or massive. Neutron stars, the extremely dense cores of stars much bigger than the Sun that exploded billions of years ago in the early history of globular clusters, have a similar mass to blue stragglers, and are affected by the sedimentation process, but they are incredibly difficult to observe and therefore do not make a useful subject for this study. Blue stragglers are the only stars within clusters that combine high mass and high brightness. Of the 21 clusters covered by this research, 20 were studied with Hubble, 12 with the MPG/ESO 2.2-metre telescope, eight with the Canada-France-Hawaii telescope and one with NAOJ’s Subaru Telescope. Such a rate depends in a complex manner on the number of stars, their density and their velocity within a cluster. While the first two quantities are relatively easy to measure, velocity is not. For these reasons, previous estimates of the rate of globular cluster dynamical aging were based only on theoretical arguments, while the new method allows a totally empirical measurement.